Prototype: 4 sections of straight track (length: 188.3 mm / 7-3/8"), 7 sections of straight track (length: 171.7 mm / 6-3/4"), 2 sections of curved track (turnout curves), 1 left turnout and 1 right turnout made of sturdy plastic just right for children. Instructions with different setup possibilities are included. 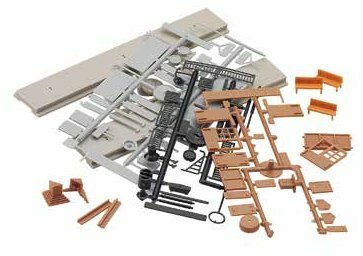 Ideal expansion of the Märklin my world starter sets to include either a passing siding or storage sidings. Prototype: 2 no. 24172 straight track, 1 no. 24224 curved track, 1 no. 24611 left turnout, 1 no. 24977 track bumper, and instructions. Prototype: Atchison, Topeka & Santa Fe Railway (AT & SF) triple unit (A-B-B) EMD F 7 diesel locomotive with 6 streamliner passenger cars. The train ran under the name "Super Chief" between Chicago (IL) and Los Angeles (CA). Locomotive road number 305. Model: The locomotive has an mfx digital decoder with extensive sound functions. It also has controlled high-efficiency propulsion in the A unit and in one B unit. 2 axles in each of the units powered. Traction tires. The headlights will work in conventional operation and can be controlled digitally. A Mars light can be controlled separately. The lighted side number boards and the position lights can be controlled digitally. Maintenance-free warm white LEDs are used for the lighting. The engineer's cab has interior lighting. There is a permanent drawbar between the locomotive units. The locomotive has current-conducting couplings. It also has separately applied metal grab irons. All of the cars have factory-installed LED interior lighting that can be controlled digitally. The interior lighting is supplied by means of a continuous electrical connection through the entire train. All of the cars have current-conducting couplers that can be uncoupled. The observation car has marker lights. Total train length approximately 205 cm / 80-3/4". Numbered certificate of authenticity included. Lighted number boards and position lights. Comment: "The Train of the Stars" ? The Super Chief. When the Union Pacific Railroad (UP) introduced its new "streamliner train", the "City of Los Angeles" in 1936 (Chicago ? Los Angeles), the Atchison, Topeka & Santa Fe Railway (Santa Fe) countered with its own deluxe train, the "Super Chief", as early as May 12, 1936. This very first "Super Chief" initially still consisted of heavyweight Pullman cars, because the new streamline stainless steel lightweight cars were still under construction at the Budd Company. This new super train was to be pulled at the same time by new diesel locomotives, also with streamlined styling. In May of 1937 it was finally done: Budd presented a "streamliner" train as an all-Pullman sleeping car train, without competition in style, design, and luxury. The famous designed Sterling McDonald found expression in the interior details the longstanding relation between the railroad and the Indians of the Southwest. Whenever possible McDonald made use of authentic Indian colors such as turquois and copper, samples and even authentic wall murals and paintings. In addition, he integrated as decorative elements a combination of rare and exotic woods such as ebony, teak, satinwood, bubinga, and Macassar, which gave the Super Chief an additional air of extravagant elegance. A new train naturally needed new, elegant locomotive, which were delivered at the same time by General Motors EMD in the form of the E-1 diesel models with a streamlined hood. A new color scheme was used for the first time here in red, yellow, and silver ? later designated as the "Warbonnet" design, which was supposed to symbolize the headdress of an Indian with waving feathers. A speed record that still stands was reached on the Santa Fe during a test run even before the scheduled introduction of the new Super Chief to regular service. The 3,584.5 kilometer / 2,240.3 mile long route Chicago ? Los Angeles was covered on freshly renewed track in 36 hours and 20 minutes with an average speed of 97 km/h / 60 mph and peak speeds of 160 km/h / 100 mph. The scheduled travel time was 39 hours and 45 minutes. The extra fare Super Chief quickly developed into an extremely exclusive and super comfortable shuttle train for Hollywood Greats, who commuted from New York's Broadway to Sunset Boulevard in Los Angeles, and who let themselves be pampered to and from Chicago in the luxurious prestige train of the Santa Fe. The list of passengers read like a "Who's Who" in Hollywood, which included among others Frank Sinatra, Zero Mostel, Janet Leigh, Ella Fitzgerald, Elizabeth Taylor, Paul Newman, Gloria Swanson, Alan Ladd, Vincent Price, Margaret Truman, and many others. The special attraction of the train was of course the five star meals prepared by top chefs as well as its other first class services. In addition to engineer's, conductors, and brakemen, sleeping car conductors, luggage porters, dining car stewards, waiters, chefs, bartenders, lounge attendants, hair dressers, and other service personnel together with two squads of cleaners and maintenance teams provided for the welfare of the passengers. At the start of the Fifties and well into the second half of the Sixties, the famous class F7 diesel locomotives pulled the Super Chief. These locomotives were also in the "Warbonnet" design. The train was able to maintain its extremely high quality of service right up to the end of passenger trains on the Santa Fe on May 1, 1971. After that, the government owned Amtrak took over passenger train service in the USA and used the legendary name for another three years. Santa Fe took away the right to continue using the name due to the extreme deterioration of the quality of service under Amtrak management. Therefore, the train ran initially as the Southwest Limited and after a compromise between Amtrak and Santa Fe it has been run as the Southwest Chief. Prototype: German Federal Railroad (DB) unit train for volume freight. Class 151 in a double unit combination. Type Fad 167 hopper cars. The train looks as it did around 1979. Model: The set has 1 locomotive with an mfx digital decoder and extensive sound functions. The locomotive has controlled high-efficiency propulsion. Traction tires. 1 locomotive has no motor and the 60941 high-efficiency motor set can be installed in it. Traction tires. Both locomotives are coupled to each other permanently. Triple headlights that change over with the direction of travel are present on both locomotives, will work in conventional operation, and can be controlled digitally. The double "A" lights can be controlled. The set has 10 hopper cars with different car numbers. The cars have load inserts with a layer of real coal. The train is weathered. Total length over the buffers approximately 177.9 cm / 70". Second locomotive ready for installation of the 60941 high-efficiency motor set. All of the cars have different car numbers. Coal inserts sprinkled with a layer of real coal. 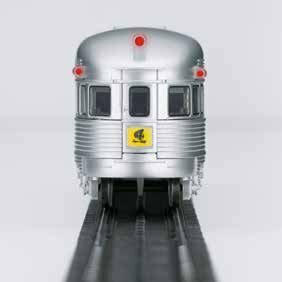 A car display to go with this train can be found in the Märklin H0 assortment under item number 00797. Prototype: German Federal Railroad (DB) passenger train and freight train. Class 043 steam locomotive with an oil tender and a class 218 diesel locomotive. One type Aüm 203 passenger car, 1st class, and 2 type Büm 234 passenger cars, 2nd class. 4 VTG light weight standard design tank cars. Model: Both locomotives have mfx digital decoders, controlled high-efficiency propulsion, and extensive sound functions. The steam locomotive has an articulated frame to enable it to negotiate sharp curves. It has 5 axles powered. Traction tires. A 7226 smoke unit can be installed in the locomotive. The steam locomotive has triple headlights that change with the direction of travel, will work in conventional operation, and can be controlled digitally. The diesel locomotive has 4 axles powered. Traction tires. It has a centrally mounted compact design motor. 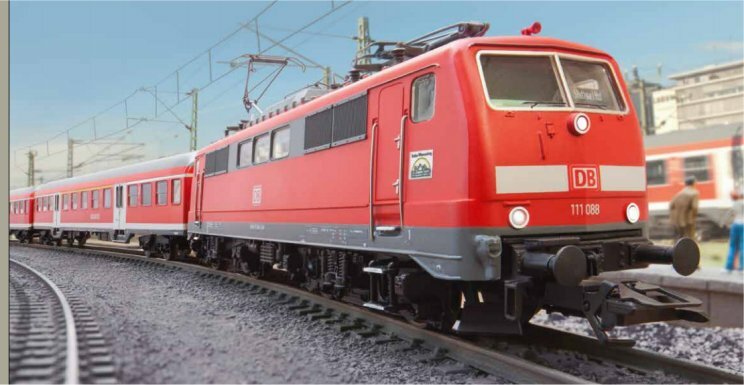 The diesel locomotive has triple headlights and 2 red marker lights that change with the direction of travel, will work in conventional operation, and can be controlled digitally. Total length of the freight train with the class 043: 83.0 cm / 32-11/16". Total length of the passenger train with the class 218: 103.5 cm / 40-3/4". Contents: The set has a large C Track layout with 3 turnouts. It also has a Central Station. The set has a 60 VA switched mode power pack to provide power to the Central Station and to accessories. Hardware material for connections is included. Extensive setup and operating instructions are also included. This set can be expanded with the C Track extension sets and with the entire C Track program. The 74491 turnout mechanism and the 74461 decoder can be installed in the turnouts. Model: The locomotive has a digital decoder and a special motor. 1 axle powered. Traction tires. The locomotive has triple headlights that change with the direction of travel, will work in conventional operation, and can be controlled digitally. The crane car has a cab that can be rotated, a boom that can be moved, and a hand crank for the crane line. The boom car has a support for the boom. The low side car has a metal model of a power shovel. All of the cars have Relex couplers. Train length 48 cm / 18-7/8". Contents: 12 no. 24130 curved track, 4 no. 24188 straight track, 1 base station, 7 no. 24172 straight track, 2 no. 24224 curved track, 1 no. 24612 right turnout and 1 no. 24611 left turnout. Switched mode power pack and a wireless infrared controller. This set can be expanded with the C Track extension sets and with the entire C Track program. The 74492 turnout mechanism can be installed in the turnouts. Model: The train has a battery powered drive and magnet couplers between the individual cars. There is a permanently coupled unit consisting of a motorized end car and a passenger car with a built-in battery holder. The train has 3 speed levels in both forward and reverse direction of travel, 3 sound functions, and triple headlights. Train length 63.0 cm / 24-13/16". Contents: 22 sections of plastic curved track, 1 crossing, and an easy-to-use, wireless infrared controller. 4 each AA and 2 each AAA batteries included. The train can be operated with 2 different frequencies (A/B), thus allowing you to add a second battery train. This set can be expanded with the plastic track extension set. Prototype: High-speed train based on a TGV Duplex. Five-part train set. Model: The train has a battery powered drive and magnet couplers between the individual cars. There is a permanently coupled unit consisting of a motorized end car and a bi-level passenger car with a built-in battery holder. The train has 3 speed levels in both forward and reverse direction of travel, 3 sound functions, and triple headlights. Train length 63 cm / 24-13/16". Contents: 22 sections of plastic curved track, 1 crossing, and an easy-to-use, wireless infrared controller. 4 each AA and 2 each AAA batteries included. The train can be operated with 2 different frequencies (C/D), thus allowing you to add a second battery train. This set can be expanded with the plastic track extension set. Prototype: French State Railways (SNCF) construction train. Class BB 22200 electric locomotive in an infra paint scheme. 1 Krupp-Ardelt crane car with a boom support car, 1 type Eaos gondola with a load insert of "sand", and 1 type Gs boxcar. Model: The locomotive has an mfx digital decoder and a controllable horn sound. It also has controlled high-efficiency. 2 axles powered. Traction tires. The locomotive has dual headlights and 2 red marker lights that change with the direction of travel, will work in conventional operation, and can be controlled digitally. The lighting is done with maintenance-free warm white and red LEDs. The crane car has a cab that can be rotated, a boom that can be moved, and a hand crank for the crane line. The boom car has a support for the boom. Train length 68.4 cm / 26-15/16". Contents: 12 no. 24130 curved track, 8 no. 24188 straight track, 7 no. 24172 straight track, 2 no. 24224 curved track, and 1 pair of no. 24612 and no. 24611 turnouts. Track connector box, switched mode power pack rated at 230 volts / 36 VA, and a Mobile Station. An illustrated instruction book with many tips and ideas is included with the set. This set can be expanded with the C Track extension sets and with the entire C Track program. Prototype: High-speed train based on an ICE. Five-part train set. Model: The train has a battery powered drive and magnet couplers between the individual cars. There is a permanently coupled unit consisting of a motorized diesel locomotive and a bi-level passenger car with a built-in battery holder. The train has 3 speed levels in both forward and reverse direction of travel, 3 sound functions, and triple headlights. Train length 61 cm / 24-3/8". Contents: 22 sections of plastic curved track, 1 crossing, and an easy-to-use, wireless infrared controller. 4 each AA and 2 each AAA batteries included. The train can be operated with 2 different frequencies (A/B), thus allowing you to add a second battery train. This set can be expanded with the plastic track extension set 23300. Prototype: Four-part freight train consisting of different locomotive and car kits in colorful paint schemes. Model: The train has a battery powered drive and magnet couplers between the individual cars. There is a permanently coupled unit consisting of a locomotive and a battery car frame. The body for the locomotive and the battery car can be changed as desired with a simple snap-together design. The train has 3 speed levels in both forward and reverse direction of travel, 3 sound functions, and triple headlights. The dump car and the flat car for containers are snap-together kits and come in the set as individual parts. These parts can also be used individually. Plastic balls are also included for a load in the dump car. Train length 52.5 cm / 20-11/16". Contents: Permanently coupled unit consisting of a locomotive and a battery car frame, a steam locomotive body with a coal tender insert, a diesel locomotive body with a car body for a boxcar, a dump car kit, a flat car kit for containers, 22 sections of plastic curved track, 1 crossing, and an easy-to-use, wireless infrared controller. 4 each AA and 2 each AAA batteries included. The train can be operated with 2 different frequencies (E/F), thus allowing you to add a second battery train. This set can be expanded with the plastic track extension set 23300. The containers can be removed individually. This starter set can be expanded with other Click and Mix items that are available under item numbers 36270, 44270, 44271, 44272, 44273, 44274, 44275, and 72205. Digital Functions for: SBB class 460 Electric Loc. Digital Functions for: SBB clas Ae 6/6 Electric Loc. Prototype: Swiss Federal Railways (SBB/CFF/FFS) passenger train and freight train. A class 460 electric locomotive with advertising lettering and a class Ae 6/6 electric locomotive. A type Apm EuroCity express train passenger car, 1st class, and 2 type Bpm EuroCity express train passenger cars, 2nd class, in the current paint scheme. A type Rilns 16 four-axle sliding tarp car, a type Hbis sliding wall boxcar, a type Zans funnel-flow tank car, and a type Snps double stake car. Model: Both locomotives have mfx digital decoders, controlled high-efficiency propulsion, and extensive sound functions. The class Re 460 electric locomotive has 2 axles powered and traction tires. It also has triple headlights and 2 red marker lights that change with the direction of travel, will work in conventional operation, and can be controlled digitally. The Re 460 has long-distance headlights that can be controlled digitally. The headlight / marker light changeover feature can be switched between the Swiss system and the white/red system. The class Ae 6/6 electric locomotive has 3 axles powered and traction tires. Total length of the passenger train with the class Re 460: 101.8 cm / 40-1/16". Total length of the freight train with the class Ae 6/6: 78.1 cm / 30-3/4". Contents: The set has a large C Track layout with 3 turnouts. It also has a Central Station. The set has a 60 VA switched mode power pack to provide power to the Central Station and to accessories. Hardware material for connections is included. Extensive setup and operating instructions are also included. Model: The locomotive has a digital decoder and a special motor with a flywheel. 4 axles powered. Traction tires. The locomotive has triple headlights that change over with the direction of travel, will work in conventional operation, and can be controlled digitally. Maintenance-free LEDs are used for the lighting. The train has 1 type X 05 low side car, loaded with a contemporary model of a vehicle. The train has 1 type Om 12 gondola, 1 tank car painted and lettered for VTG, and 1 type Pwgs 41 freight train baggage car. All of the cars have close couplers with guide mechanisms. A plastic kit is also included. Train length 61.0 cm / 24". Contents: 12 no. 24130 curved track, 8 no. 24188 straight track, 7 no. 24172 straight track, 2 no. 24224 curved track, and 1 pair of no. 24612 and no. 24611 turnouts. Track connector box, switched mode power pack rated at 230 volts / 36 VA, and a Mobile Station with a locomotive card are included. An illustrated instruction book with many tips and ideas is included with the set. This set can be expanded with the C Track extension sets and with the entire C Track program. Prototype: Child's locomotive with interchangeable bodies in a colorful design. Model: The locomotive has a battery drive and a magnet coupler. It is a permanently coupled unit consisting of a locomotive and battery car chassis. The bodies for locomotives and battery cars included can be changed as desired with a simple snap-together arrangement. The locomotive has 3 speed levels forward and reverse, 3 sound functions, and a triple headlight. Length of the unit 28.0 cm / 11". Contents: There is a permanently coupled unit consisting of a locomotive and battery car chassis, a steam locomotive body with a coal tender attachment, a diesel locomotive body with a car body for a boxcar, an electric locomotive body with a container attachment, and an easy-to-use infrared controller. 4 each AA and 2 each AAA batteries are included. This locomotive can be operated with 2 different frequencies (E/F). This locomotive goes well with the 29370 "Freight Train" starter set. Other Click and Mix items available under item numbers 44270, 44271, 44272, 44273, 44274, 44275, and 72205 can be added to this locomotive. Prototype: German Federal Railroad (DB) class 335 (Köf III) diesel switch engine in Era V. "Chinese Red" paint scheme. Version with front vent, radio remote control, and switching couplers. Model: The locomotive has an mfx digital decoder. It also has controlled high-efficiency propulsion. Both axles powered. The triple headlights and dual red marker lights change over with the direction of travel, will work in conventional operation, and can be controlled digitally. Maintenance-free warm white LEDs are used for the headlights. The headlights can be turned off at both ends. The locomotive has a Telex coupler front and rear that can be controlled separately. There is an open view through the cab, and the grab irons are separately applied. Brake lines and switching couplers are included. Length over the buffers 9.3 cm / 3-5/8". Prototype: German State Railroad (DR) class 132 "Ludmilla". The locomotive looks as it did around 1987. Model: The locomotive has an mfx digital decoder and extensive sound functions. 4 axles powered. Traction tires. The triple headlights change over with the direction of travel, will work in conventional operation, and can be controlled digitally. Maintenance-free warm white LEDs are used for the headlights. Length over the buffers 23.9 cm / 9-3/8". Prototype: GTS Rail, Italy class E 483 general-purpose electric locomotive. The locomotive looks as it did around 2011. Model: The locomotive has an mfx digital decoder and extensive sound functions. It also has a special motor centrally mounted. 4 axles powered by means of cardan shafts. Traction tires. The triple headlights and dual red marker lights change over with the direction of travel, will work in conventional operation, and can be controlled digitally. The headlights at Locomotive End 2 and 1 can be turned off separately in digital operation. Maintenance-free warm white LEDs are used for the headlights. Length over the buffers 21.7 cm / 8-1/2". A freight car set to go with this locomotive can be found under item number 47039. Model: The powered end car has a digital decoder and factory-installed sound functions that can be controlled. It also has a special motor. 2 axles powered. Traction tires. The headlights will work in conventional operation and can be controlled digitally in the powered end car (always on in the cab control car). The pantographs can be raised and lowered but are not wired to take power from catenary. Train length 102.7 cm / 40-7/16". Prototype: Class 223 general-purpose diesel electric locomotive as ER 20-013 painted and lettered for Mitsui Rail Capital Europe B.V (MRCE). Model: The locomotive has an mfx digital decoder and extensive sound functions. It also has a special motor. 4 axles powered by means of cardan shafts. Traction tires. The triple headlights and dual red marker lights change over with the direction of travel, will work in conventional operation, and can be controlled digitally. Maintenance-free warm white and red LEDs are used for the lighting. Length over the buffers 21.7 cm / 8-1/2". Prototype: German Federal Railroad (DB) class Köf II. Version with an open cab. Model: The locomotive has an mfx digital decoder and Telex couplers. 2 axles powered. 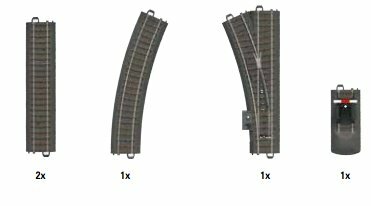 Track adhesion magnets are included on the locomotive to improve pulling power. The locomotive has separately applied metal grab irons. The headlights will work in conventional operation and can be controlled digitally. Length over the buffers 7.4 cm / 2-7/8". Prototype: Bavarian class PtL 2/2 local railroad locomotive as the class 98.3 "Glaskasten" on the German Federal Railroad (DB). The locomotive looks as it did in Era III around 1954. Model: The locomotive has an mfx digital decoder. It also has a miniature motor in the boiler. 2 axles powered. Traction tires. The dual headlights change over with the direction of travel, will work in conventional operation, and can be controlled digitally. The inner boiler is constructed of metal. The locomotive has numerous separately applied handrails and grab irons. The boiler parts and other details are finely reproduced. Length over the buffers 8.0 cm / 3-1/8". Prototype: German Federal Railroad (DB) class 110.3. Express locomotive with aerodynamic ends, with the so-called "Pants Crease" look. Ocean blue / ivory paint scheme. Rebuilt version with rectangular Klatte vent grills, rectangular engine roof windows, without a continuous rain gutter, without skirting, and without buffer cladding. The locomotive looks as it did around 1985. Model: The locomotive has an mfx digital decoder and extensive sound functions. It also has controlled high-efficiency propulsion, centrally mounted. 4 axles powered by means of cardan shafts. Traction tires. The triple headlights and dual red marker lights change over with the direction of travel, will work in conventional operation, and can be controlled digitally. Maintenance-free warm white LEDs are used for the headlights. The locomotive has separately applied metal grab irons. The engineer's cab has interior details, and a separately applied control wheel. The locomotive has separately applied roof walks. Length over the buffers 18.9 cm / 7-7/16". Passenger cars to go with this locomotive can be found in the Märklin H0 assortment under item numbers 43912, 43923, 43924, 43932, and 43960. Prototype: Royal Prussian Railroad Management (KPEV) class P8. The locomotive looks as it originally did with a box-style tender. Model: The locomotive has an mfx digital decoder and extensive sound functions. It also has controlled high-efficiency propulsion. 3 axles powered. Traction tires. The dual headlights change over with the direction of travel, will work in conventional operation and can be controlled digitally. A 72270 smoke generator can be installed in the locomotive. The model is finely constructed with numerous details typical of the era and a detailed engineer's cab. Length over the buffers 21.8 cm / 8-9/16". 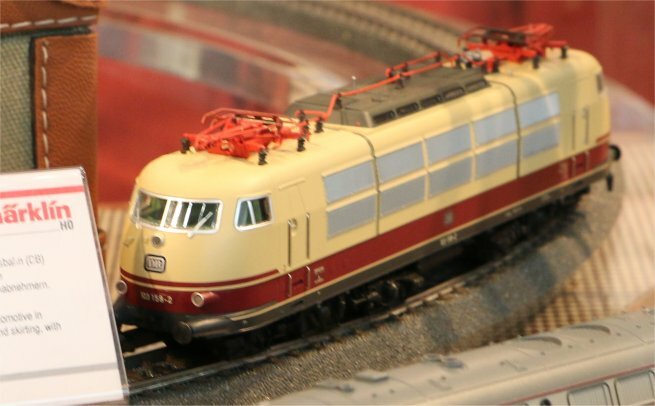 A set of passenger cars to go with this locomotive can be found in the Märklin H0 assortment under item number 42041. Prototype: German Federal Railroad (DB) class 80 tank locomotive. The locomotive looks as it did around 1958. Model: The locomotive has an mfx digital decoder and extensive sound functions. It also has controlled high-efficiency propulsion. 3 axles powered. Traction tires. The dual headlights change over with the direction of travel, will work in conventional operation, and can be controlled digitally. The locomotive has many separately applied details. Length over the buffers 11.1 cm / 4-3/8". Prototype: Württemberg State Railways (K.W.St.E.) class K freight steam locomotive. The locomotive looks as it did around 1918. Model: The locomotive has an mfx digital decoder and extensive sound functions. It also has controlled high-efficiency propulsion. The frame is designed to negotiate sharp curves and has side axle play. 6 axles powered. Traction tires. The 7226 smoke unit can be installed in the locomotive. The dual headlights change over with the direction of travel. They and the smoke unit that can be installed in the locomotive will work in conventional operation and can be controlled digitally. Maintenance-free warm white LEDs are used for the headlights. There is an adjustable close coupling between the locomotive and the tender. Length over the buffers 23.5 cm / 9-1/4". Prototype: German Federal Railroad (DB) class 01.10 express steam locomotive with oil firing and Witte smoke deflectors. The locomotive looks as it did around 1966/67. Model: The locomotive has an mfx+ digital decoder and extensive sound functions. It also has controlled high-efficiency propulsion. 3 axles powered. Traction tires. The 7226 smoke unit can be installed in the locomotive. The triple headlights change over with the direction of travel. They and the smoke unit that can be installed in the locomotive will work in conventional operation and can be controlled digitally. The running gear lights can also be controlled digitally. There is a close coupler with an NEM pocket on the tender. Protective sleeves for the piston rods are included as detail parts. Length over the buffers 28.1 cm / 11-1/16". Prototype: Dutch State Railways (NS) class 1200 heavy general-purpose locomotive. Road number 1222. Model: The locomotive has an mfx+ digital decoder and extensive sound functions. It also has controlled high-efficiency propulsion. 4 axles powered. Traction tires. The triple headlights and dual red marker lights change over with the direction of travel, will work in conventional operation, and can be controlled digitally. Maintenance-free warm white and red LEDs are used for the lighting. The locomotive has separately applied metal grab irons. Brake hoses can be mounted on the buffer beam. Length over the buffers 20.8 cm / 8-3/16"
Now with a centrally mounted motor. 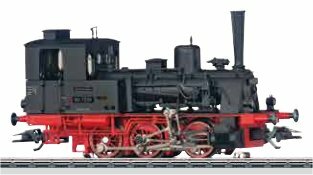 A car set to go with this locomotive can be found in the Märklin H0 assortment under item number 43543. Model: The locomotive has an mfx digital decoder and extensive sound functions. It also has controlled high-efficiency propulsion. 4 axles powered. Traction tires. The triple headlights and dual red marker lights change over with the direction of travel, will work in conventional operation, and can be controlled digitally. Maintenance-free warm white and red LEDs are used for the lighting. The locomotive has separately applied metal grab irons. Brake hoses can be mounted on the buffer beam. Length over the buffers 20.8 cm / 8-3/16". Prototype: Dutch State Railways (NS) class 1200 heavy general-purpose locomotive. Advertising design for the anniversary of 175 years of railroading in the Netherlands. The locomotive looks as it did in 2013. 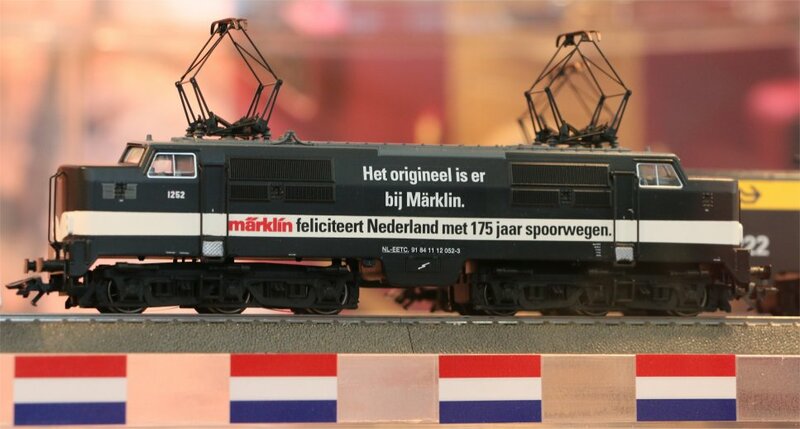 Advertising locomotive for the anniversary of 175 years railroading in Holland. Prototype: German State Railroad Company (DRG) class 73 (former D XII) tank locomotive. Road number 73 085. The locomotive looks as it did in the Twenties. Model: The locomotive has an mfx digital decoder. It also has controlled high-efficiency propulsion with a flywheel in the boiler. 2 axles powered. Traction tires. The dual headlights change over with the direction of travel, will work in conventional operation, and can be controlled digitally. Maintenance-free warm white LEDs are used for the lighting. The locomotive has many separately applied details. Length over the buffers 13.8 cm / 5-7/16". Prototype: German Federal Railroad (DB) class 89.70-75 tank locomotive. Former Prussian class T 3 branch line locomotive. Road number 89 7339. The locomotive looks as it did at the start of the Fifties. Model: The locomotive has an mfx digital decoder and extensive sound functions. It also has a miniature motor in the boiler. 3 axles powered. Traction tires. The locomotive has a detailed frame with a representation of Allan valve gear. The dual headlights change over with the direction of travel, will work in conventional operation, and can be controlled digitally. Maintenance-free warm white LEDs are used for the lighting. There is an open view through the cab. The locomotive has many separately applied details. Brake hoses are included. Length over the buffers 9.9 cm / 3-7/8". Steam locomotive sounds for the first time. Prototype: German Federal Railroad (DB) class 52 steam locomotive. Version with a tub-style tender and Witte smoke deflectors. The locomotive looks as it did around 1953. Model: The locomotive has an mfx digital decoder and extensive sound functions. It also has controlled high-efficiency propulsion. 5 axles powered. Traction tires. The locomotive's frame is articulated to enable the locomotive to negotiate sharp curves. The dual headlights change over with the direction of travel, will work in conventional operation and can be controlled digitally. A 7226 smoke generator can be installed in the locomotive. Piston rod protection sleeves are included and can be installed on the locomotive. Length over the buffers 26.3 cm / 10-3/8". Prototype: Belgian State Railways (SNCB) class 98 (former class 94.5) freight tank locomotive. Green basic paint scheme with a black smoke box and gold boiler bands. Road number 98.016. Prototype: Royal Prussian Railroad Administration (KPEV) class T 16.1 freight tank locomotive. Brownish green basic paint scheme. With the bell and pre-heater on the top of the boiler as well as older design buffers. Road number 8118 Magdeburg. The locomotive looks as it did around 1916. Model: The locomotive has the new mfx+ digital decoder and extensive sound functions. It also has controlled high-efficiency propulsion with a flywheel in the boiler. 5 axles powered. Traction tires. The locomotive is constructed mostly of metal. The locomotive comes with a 72270 smoke unit already installed. The dual headlights change over with the direction of travel. They and the built-in smoke unit will work in conventional operation and can be controlled digitally. Maintenance-free warm white LEDs are used for the lighting. The locomotive has Telex couplers front and rear for remote-controlled uncoupling from cars. The locomotive has a switching range with a switching light function front and rear that can be controlled digitally. Figures of a locomotive engineer and a fireman, piston rod protection sleeves, and brake hoses are included. Length over the buffers 14.6 cm / 5-3/4". Telex couplers front and rear included. 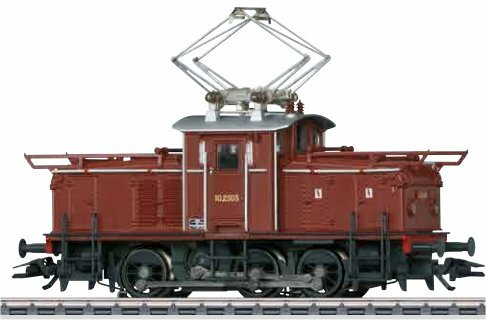 A freight car set to go with this locomotive can be found in the Märklin H0 assortment under item number 46084. Prototype: French State Railways (SNCF) class 050 TA (former class 94.5) freight tank locomotive. Green basic paint scheme with a black smoke box. Without a pre-heater and without a smoke stack attachment. Road number 050 TA 23. Model: The locomotive has the new mfx+ digital decoder and extensive sound functions. It also has controlled high-efficiency propulsion with a flywheel in the boiler. 5 axles powered. Traction tires. The locomotive is constructed mostly of metal. A 72270 smoke unit can be installed in the locomotive. The dual headlights change over with the direction of travel. They and the smoke unit that can be installed in the locomotive will work in conventional operation and can be controlled digitally. Maintenance-free warm white LEDs are used for the lighting. Piston rod protection sleeves and brake hoses are included. Length over the buffers 14.6 cm / 5-3/4". Prototype: German State Railroad Company (DRG) class elT Breslau 1004 (later the class ET 87) electric powered rail car train, wheel arrangement 2'1 + B'1 + 1 2'. Consisting of a type BC3ielS Breslau 2004 (later type ES 87 03a) control car "a" (with 1st and 2nd class), a type PwPost3ielT Breslau 1004 (later type ET 87 03) power car (with baggage and mail compartments), and a type CC3itrelS Breslau 2014 (later type ES 87 03b) control car "b" (with 3rd class compartments and baggage compartment). Authentic paint scheme for Era II. The train looks as it did around 1937. Model: The train has an mfx digital decoder and extensive sound functions. It also has controlled high-efficiency propulsion and a prototypically powered center unit. 2 axles powered. Traction tires. The dual headlights change over with the direction of travel. Maintenance-free LEDs are used for the interior lighting. The headlights and interior lighting will work in conventional operation and can be controlled digitally. The passenger areas of the train have interior details. There is an open view in the engineer's cabs. The train has special close couplings between the cars and the ends of the train have NEM coupler pockets. Length over the buffers 49.0 cm / 19-1/4". Comment: Powered Rail Car Train Pioneer. In 1914, the KPEV purchased a total of 6 three-unit powered rail car trains for the route in Silesia between Nieder Salzbrunn and Halbstadt with its many grades. These 6 trains were acquired to better manage the constantly increasing passenger volumes in this region. These rail car trains were initially designated as the E.T. 501-506, and they had a visually striking design that was based in part on the express train passenger cars commonly in use at that time with their clerestories, truss rods, and inset doors. The paint scheme in green/beige followed KPEV practice. The motor car located between the two cab control cars ensured good running characteristics on routes with curves. Since the passenger volumes into what was now Czechoslovakian Halbstadt almost died off after World War I, these rail car trains were used on other routes. These trains were subsequently taken into the DRG roster and painted in the cream/red scheme for powered rail cars at that time. After World War II, three of these trains came to Bavaria and were used there until 1959. The long years of service are proof of the successful and durable design from the pioneer days of rail car trains. Prototype: DB Regio AG Baden-Württemberg class 111 general-purpose electric locomotive in Era VI. Model: The locomotive has an mfx+ digital decoder and extensive sound functions. It also has controlled high-efficiency propulsion. 2 axles powered. Traction tires. The triple headlights and dual red marker lights change over with the direction of travel, will work in conventional operation, and can be controlled digitally. Maintenance-free warm white and red LEDs are used for the lighting. Length over the buffers 19.1 cm / 7-1/2". Cars to go with this locomotive can be found in the Märklin H0 assortment under item numbers 43806, 43816, and 43831. Prototype: Swiss Federal Railways (SBB) class Re 4/4 II (class 420) electric locomotive. Rebuilt version as part of the LION program. "Fire Red" basic paint scheme. The locomotive looks as it currently does in real life. Model: The locomotive has an mfx digital decoder and extensive sound functions. It also has controlled high-efficiency propulsion. 2 axles powered. Traction tires. The triple headlights and 1 white marker light (Swiss light code) change over with the direction of travel, will work in conventional operation, and can be controlled digitally. When the locomotive is running "light" the lighting can be switched to 1 red marker light. The headlights at Locomotive End 2 and 1 can be turned off separately in digital operation. When the headlights are turned off at both ends of the locomotive, then the double "A" light is on as a red emergency light. Maintenance-free warm white and red LEDs are used for the lighting. The locomotive has separately applied metal grab irons on the sides and the ends. It also has a representation of the air conditioning on the sides. The couplers can be replaced by end skirting included with the locomotive. Length over the buffers 17.1 cm / 6-3/4". Rebuilt version with new air conditioning, rear view mirror, and headlights. Prototype: German Federal Railroad (DB) class 139. The locomotive looks as it did in Era IV. Model: The locomotive has an mfx digital decoder and extensive sound functions. It also has controlled high-efficiency propulsion. 4 axles powered. Traction tires. The triple headlights and dual red marker lights change over with the direction of travel, will work in conventional operation, and can be controlled digitally. Maintenance-free warm white and red LEDs are used for the headlights. The locomotive has separately applied metal grab irons. Length over the buffers 18.9 cm / 7-7/16". Prototype: Swedish private railroad TAGAB class Rc 2. Upper headlights / marker lights as on the Austrian class 1043 locomotives. Red single-arm pantographs, older design snowplow. The locomotive looks as it currently does in real life. Model: The locomotive has an mfx digital decoder and extensive sound functions. It also has controlled high-efficiency propulsion. 2 axles powered. Traction tires. The triple headlights change over with the direction of travel, will work in conventional operation, and can be controlled digitally Length over the buffers 18.0 cm / 7-1/8". Model: The train has an mfx+ digital decoder and extensive sound functions. It comes in a four-part version. The powered end car has a die-cast frame. The train has controlled, high-efficiency propulsion with a flywheel. 2 axles in one truck powered. Traction tires. The engineer's cabs in both end cars have interior details. The train has power pickup in the end car at the front of the train; the power pickup changes with the direction of the train. It also has special close couplers with a guide mechanism. The train has factory-installed interior lighting. The interior details vary with the type of car. The triple headlights, dual red marker lights, and the interior lighting will work in conventional operation and can be controlled digitally. The headlights at car ends 2 and 1 can be turned off separately in digital operation. Light yellow and red LEDs are used for the headlights and marker lights. Warm white LEDs are used for the interior lighting. The construction of the running gear and the bodies is detailed. There is a representation of the "Scharfenberg" coupler with a cover on the end cars. A rigid drawbar coupling is included for multiple unit operation. The end cars come from the factory with closed crossover doors. A plug-in part included with the train makes it possible to represent swinging doors with a diaphragm pushed to the side on one end car. Total train length 114.8 cm / 45-3/16". Extensive sound and light functions included. Comment: The "Koploper". In the mid-Seventies, the Dutch State Railways needed new material to modernize its express passenger service. Trains with flexible utilization are required in this densely populated country in order to manage service in the urban areas. As a result, from 1977 to 1994, a total of 144 powered rail cars, the "Koploper" family, were placed into service. These powered rail cars could be separated and coupled at stops quickly and easily. It also became important that passengers be able to change from one unit to the other, when the train was in motion. The engineer's cabs were thus quickly raised up one level and these powered rail cars were equipped with crossovers at the ends. This feature gives the "Koplopers" a brawny, unusual look. 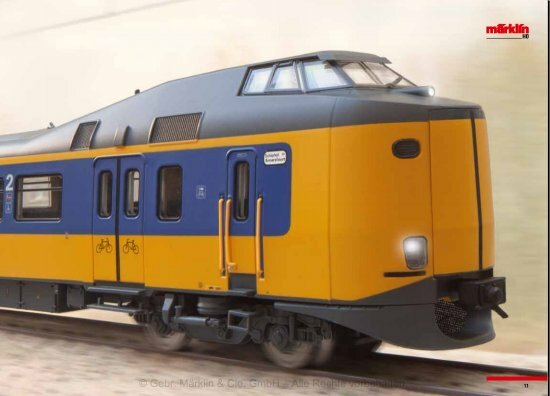 The "Koplopers" were built by the firms Talbot, CEM Oerlikon, and Holec, and were designated by the Dutch State Railways as the classes 4000 and 4200, which differed from one another in their motors, among other things. A short while ago the "Koplopers" underwent modernization and were equipped with air conditioning and facilities for handicapped people. These powered rail cars can reach 160 km/h / 100 mph and are run in the classic NS paint scheme, but they have also been used as advertising surfaces such as for the Olympic Games in 2008 in Beijing. 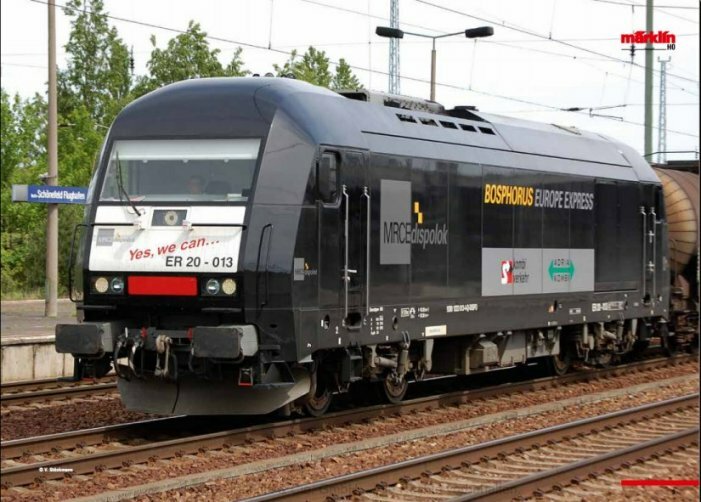 The "Koplopers" are certainly a successful development in rail vehicle technology and their unusual appearance is clearly leaving its mark on passenger service in the Netherlands. Prototype: German Federal Railroad (DB) class E 44 general-purpose locomotive. The locomotive looks as it did around 1958. Model: The locomotive has an mfx+ digital decoder and extensive sound functions. It also has controlled high-efficiency propulsion. 4 axles powered. Traction tires. The triple headlights and dual red marker lights change over with the direction of travel, will work in conventional operation, and can be controlled digitally. Maintenance-free warm white and red LEDs are used for the lighting. Length over the buffers approximately 17.5 cm / 6-7/8". This locomotive can be found in a DC version under item number 22442. 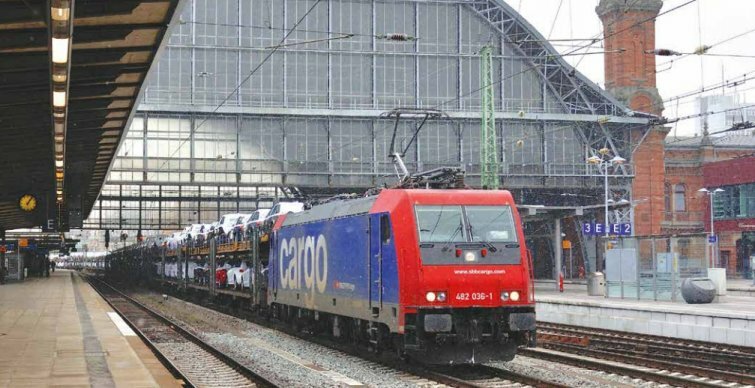 Prototype: SBB Cargo class 482 electric locomotive. The locomotive looks as it did around 2012. Model: The locomotive has an mfx digital decoder and extensive sound functions. It also has controlled high-efficiency propulsion. 4 axles powered. Traction tires. The triple headlights and dual red marker lights change over with the direction of travel, will work in conventional operation, and can be controlled digitally. Long-distance headlights can also be turned on. The headlights / marker lights can be switched to the Swiss headlight / marker light code. Maintenance-free warm white and red LEDs are used for the lighting. Length over the buffers approximately 21.7 cm / 8-1/2". Prototype: German Railroad, Inc. (DB AG) class 146.2 electric locomotive. The locomotive looks as it did around 2012. Model: The locomotive has an mfx digital decoder and extensive sound functions. It also has controlled high-efficiency propulsion. 4 axles powered. Traction tires. The triple headlights and dual red marker lights change over with the direction of travel, will work in conventional operation, and can be controlled digitally. Lighted train destination signs, Maintenance-free warm white and red LEDs are used for the lighting. Length over the buffers approximately 21.7 cm / 8-1/2". Prototype: German Railroad, Inc. (DB AG) class 420 S-Bahn powered rail car train. The looks as it currently does in real life in the "Traffic Red" commuter service paint scheme. Road numbers 420 363-4, 421 363-3, 420 863-3. Model: German Railroad, Inc. (DB AG) class 420 S-Bahn powered rail car train. The looks as it currently does in real life in the "Traffic Red" commuter service paint scheme. Road numbers 420 363-4, 421 363-3, 420 863-3. Prototype: Royal Prussian Railroad Administration (KPEV) class G 8.1 steam freight locomotive, with a type 3 T 16,5 box-style tender. The locomotive looks as it did shortly after being delivered by Borsig in 1917. Locomotive number 9.936 in the delivery book of A. Borsig-Werke, Berlin-Tegel, Germany. Model: The locomotive has an mfx digital decoder, controlled high-efficiency propulsion, and extensive sound functions. 4 axles powered. Traction tires. The locomotive and tender are constructed mostly of metal. The 7226 smoke unit can be installed in the locomotive. The dual headlights change over with the direction of travel. They and the smoke unit that can be installed in the locomotive will work in conventional operation and can be controlled digitally. Maintenance-free warm white LEDs are used for the lighting. The engineer's cab has interior details. There is a permanent close coupling between the locomotive and tender. Protective sleeves for the piston rods, brake hoses, and prototype couplers are included. Length over the buffers 21.0 cm / 8-1/4". 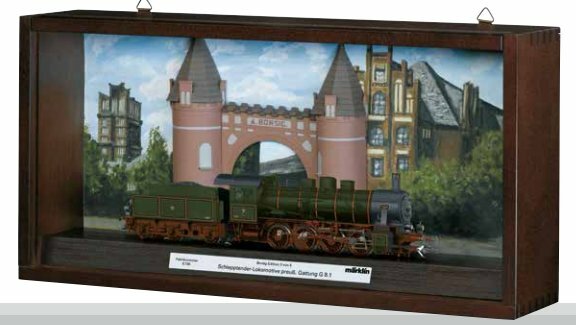 A suitable collector's display case is included and is constructed of wood and glass with a backdrop relief of the characteristic Borsig gate of the Borsig locomotive works in Berlin-Tegel. There is an engraved metal plate with the builder number on the display case base. A high quality excerpt from the delivery book is included. Suitable collector's display case with a relief background. One-time series (model 3 of 5). Comment: Borsig -- Pioneer Locomotive Builder of Europe. When August Borsig opened his machinery building and iron casting company in 1837 in Berlin, probably no one suspected that out of it would come one of the largest locomotive builders in the world. As early as 1841 August Borsig built the locomotive BORSIG with the builder number 1 after painstaking investigation into the typical English and American locomotive types for that time. This locomotive impressed people with an improved valve gear and axle system and on July 21, 1841 won a contest against an English locomotive with a 10 minute head start. From this day the victorious path of Borsig locomotive building began that did not end until 1954 after more than 16,000 finished locomotives. During the era of steam locomotive building Borsig evolved all over Europe into the greatest and second largest locomotive builder worldwide. In honor of the 175th anniversary of the firm Borsig Märklin is issuing a five-part special series of sought after H0 models, which will end in 2016 on the 175th anniversary of steam locomotive building in Germany. Every year a locomotive with exquisite detailing and technically premium features will be issued as a one-time series. Each of these models will be delivered with a decorative display case whose backdrop will be designed with a high quality relief of the characteristic Borsig gate. In addition to the relief, the display case will be provided with an engraved metal plate showing the builder number from the delivery book. Each locomotive will also include an excerpt from the Borsig delivery book printed on high quality paper to round out this theme. Prototype: Swiss Federal Railways (SBB/CFF/FFS) class RAe four-system electric powered rail car train, 1st class. 6 part unit with 1 control car, 1 open seating car, 1 motor car with a galley, 1 bar car with an open seating compartment, 1 open seating car, and 1 control car. Crimson red / beige TEE basic paint scheme as RAe TEE 1052 "Cisalpin". Used in international TEE service from Milan via Domodossola - Simplon-Brig - Lausanne - Vallorbe - Dijon to Paris. The train looks as it did in the mid-Seventies. Model: The train has the new mfx+ digital decoder and extensive sound functions mounted in the motor car. It also has controlled high-efficiency propulsion with a flywheel, centrally mounted in the motor car. 4 axles powered through cardan shafts. Traction tires. The triple headlights and dual red marker lights change over with the direction of travel, will work in conventional operation, and can be controlled digitally. The train has factory-installed interior lighting that can be controlled separately in digital operation. The cab lighting in engineer's cabs 1 and 2 can each be controlled separately in digital operation. Maintenance-free warm white and red LEDs are used for the lighting. The train has four different pantographs in an offset arrangement and detailed roof equipment. The train also has separately applied metal grab irons. The engineer's cabs and the passenger areas have interior details. There is a special close-coupled mechanical and electrical connection between the cars. Both end cars have pickup shoes, and the power pickup switches automatically to the pickup shoe at the front of the train. The ends of the train have a representation of the Scharfenberg coupler (non-working). Minimum radius for operation 360 mm / 14-3/16". Train length approximately 161.0 cm / 63-3/8". Prototype: German Federal Railroad (DB) class 55 freight steam locomotive with a tender. Version without a surface pre-heater and without a piston-type feed pump. With buffer plate warning stripes. The locomotive looks as it did around 1959. Model: The steam locomotive has an mfx digital decoder and extensive sound functions. It also has controlled high-efficiency propulsion in the boiler. 4 axles powered. Traction tires. The locomotive and tender are constructed mostly of metal. The 72270 smoke unit can be installed in the locomotive. The triple headlights change over with the direction of travel. They and the smoke unit that can be installed in the locomotive will work in conventional operation and can be controlled digitally. Maintenance-free warm white LEDs are used for the lighting. The engineer's cab has interior details. There is a permanent close coupling between the locomotive and tender. The locomotive has many separately applied details. Protective sleeves for the piston rods and brake hoses are included as detail parts. Length over the buffers 21.0 cm / 8-1/4". Prototype: Swiss Federal Railways (SBB) class Be 6/8 II freight locomotive. Class from the first production series. A dark brown version as it originally looked around 1922, walk-over plates at the ends, small steps for brakemen, without a wrong track operation light, and without an inductive magnet. Locomotive road number 14268. A pine green version, with open buffers, with some cab doors sealed, without walk-over plates at the ends, with wide steps for brakemen, with a wrong track operation light, and with an inductive magnet. The locomotive looks as it did around 1963. Model: The locomotive has an mfx digital decoder and extensive sound functions. It also has 2 controlled, high-efficiency propulsion systems with flywheels, 1 motor for each powered truck. 3 axles and jackshaft powered in each powered truck. Traction tires. The locomotive frame is articulated to enable the locomotive to negotiate sharp curves. The triple headlights and 1 white marker light (Swiss headlight / marker light code) change over with the direction of travel, will work in conventional operation, and can be controlled digitally. When the locomotive is running "light" the lighting can be changed to 1 red marker light. Maintenance-free warm white and red LEDs are used for the lighting. The locomotives have highly detailed metal construction with many separately applied details. The locomotive body comes in 3 parts with hoods that swing out separately. The roof equipment is detailed with safety grills beneath the pantographs. Length over the buffers 22.3 cm / 8-3/4". Locomotive powered w/2 high-efficiency propulsion systems, each with a flywheel. 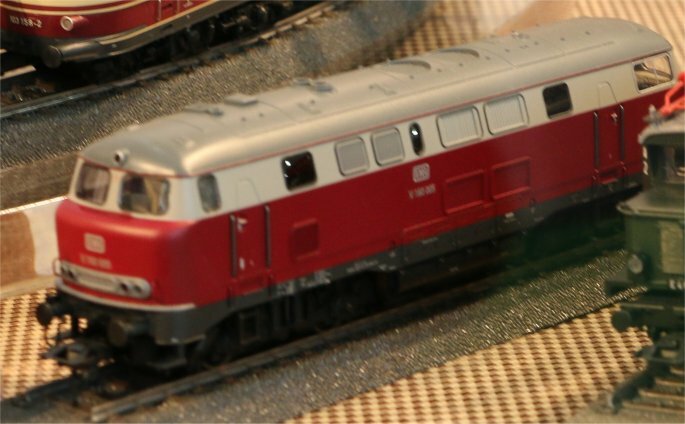 Prototype: German Federal Railroad (DB) class 103.1 electric locomotive in crimson/beige. With two rows of side vents, without end skirting, with buffer cladding, and single-arm pantographs. Used in IC service. The locomotive looks as it did at the start of the Eighties. Model: The locomotive has an mfx digital decoder and extensive sound functions. It also has controlled high-efficiency propulsion. 3 axles powered. Traction tires. The triple headlights and dual red marker lights change over with the direction of travel, will work in conventional operation, and can be controlled digitally. The engine room lighting can be controlled separately in digital operation. Maintenance-free warm white and red LEDs are used for the lighting. The locomotive has separately applied metal grab irons. The locomotive has detailed roof equipment. Length over the buffers 21.9 cm / 8-5/8". Prototype: German Federal Railroad (DB) class V 60 switch engine. The locomotive looks as it did around 1960. Model: The locomotive has an mfx digital decoder and extensive sound functions. It also has controlled high-efficiency propulsion and Telex couplers. 3 axles powered. Traction tires. The headlights will work in conventional operation and can be controlled digitally. The locomotive has metal handrails on the end platforms. Length over the buffers 12.0 cm / 4-3/4". Prototype: Austrian Federal Railways (ÖBB) class 1018.0 electric locomotive in a pine green basic paint scheme. Rebuilt version corresponding to the ÖBB standardization of this class starting in 1966. Road number 1018.04. The locomotive looks as it did about the start of the Seventies. Model: The locomotive has an mfx digital decoder and a locomotive whistle sound that can be controlled. It also has controlled high-efficiency propulsion. 2 axles powered. Traction tires. The triple headlights and 1 red marker light change over with the direction of travel, will work in conventional operation, and can be controlled digitally. The headlights are the so-called "Stielaugen" / "Telescope Eyes". The headlights at locomotive ends 2 and 1 can be turned off separately in digital operation. When the headlights are turned off at both ends, the double "A" lights are on. Maintenance-free warm white and red LEDs are used for the lighting. The engineer's cabs and engine room have interior details. The body has numerous separately applied details. The locomotive has prototypical double-arm pantographs. It also has a finely detailed frame with prototypical reproduction of the quill drive wheels. The buffers are made of metal and are separately applied in convex and flat versions. Length over the buffers 19.5 cm / 7-11/16". ÖBB rebuilt version with so-called "Stielaugen" / "Telescope Eyes" headlights. mfx decoder with locomotive whistle sound. Warm white and red LEDs are used for the lighting. Prototype: Class 6400 general-purpose locomotive in a lashup of 2 units. Locomotives painted and lettered for DB Schenker Rail Nederland NV. Model: The locomotives have an mfx digital decoder and sound functions. One locomotive also has controlled high-efficiency propulsion. 4 axles powered. Traction tires. The triple headlights and dual red marker lights at the external ends of the locomotives change over with the direction of travel, will work in conventional operation, and can be controlled digitally. Maintenance-free warm white LEDs are used for the headlights. Double "A" lights can be turned on. Both locomotives each have a Telex coupler. The locomotives are permanently coupled to one another. Length over the buffers 33 cm / 13". Class 6400 with Telex couplers for the first time. New roof equipment with additional antennas. Double "A" lights can be turned on. Prototype: Bavarian Regiobahn BRB LINT 41 diesel powered commuter rail car train. Version as the "Puppenkistenzug" / Puppenkiste Marionette Theater Train. Use: Commuter service in the greater Augsburg area and Ingolstadt. Model: The model has an mfx digital decoder and extensive sound functions. It also has controlled high-efficiency propulsion. The model also has a powerful can motor and a flywheel, mounted in a Jakobs truck. 2 axles powered. Traction tires. The model has factory-installed interior lighting. The headlights and interior lights are maintenance-free, warm white LEDs. The destination signs are prototypically correct with yellow LEDs. The headlights, interior lights, destination signs, and 2 red marker lights will work in conventional operation and can be controlled digitally. The running gear and the body are well detailed and there is a clear view through the windows. The model has interior details, a closed diaphragm, and a guide mechanism on the Jakobs truck between the two halves of the unit. Center buffer couplers are represented at the ends of the model. Total length 48.1 cm / 18-15/16". Special version with themes from the Augsburg Puppenkiste Marionette Theater. Prototype: Swedish State Railways (SJ) class Dm heavy ore locomotive as a 2-part side rod electric locomotive. Used on the ore line Lulea - Kriruna - Narvik. Series 1200 with road numbers 1205+1206. Brown basic paint scheme, large headlights, engineer's cab doors in the old arrangement, large snowplows (Norrland plows) and SAB rubber spring wheels. The locomotive looks as it did around 1965, before the installation of the middle part. Model: The locomotive has the new mfx+ digital decoder and extensive sound functions. It also has 2 controlled, high-efficiency propulsion systems with flywheels, 1 motor in each locomotive unit with an engineer's cab. All 4 driving axles powered in each locomotive unit with an engineer's cab. Traction tires. The dual headlights and a red marker light change over with the direction of travel, will work in conventional operation, and can be controlled digitally. An additional third wide beam headlight above on the locomotives can be controlled digitally. The engine room lighting as well as the cab lighting in Engineer's Cabs 1 and 2 can each be controlled separately in digital operation. An additional marker light can be controlled digitally. Maintenance-free warm white and red LEDs are used for the lighting. This locomotive has highly detailed metal construction with many separately applied details. The roof equipment is detailed with large vent attachments and compressed air tanks. Both locomotive units are permanently coupled together. There is a close coupling mechanism between the locomotive units. Marker signs for the front end of the locomotive are included separately. Length over the buffers 29.2 cm / 11-1/2". Comment: The Ore Railroad Lule† ? Gällivare ? Kiruna ? Narvik As early as the mid-18th century, iron ore was being dug in the area around the north Swedish cities of Gällivare and Kiruna and was extremely sought after all over the world because of its high iron content. Starting in 1860, the companies involved in mining the ore were looking for new ways to ensure efficient transport of their ore to the harbors of Lule† in Sweden and Narvik in Norway. Indeed, the railroad seemed "the" suitable means of transport, but initially large investments had to be made. All the same, in 1888 the 202 kilometer / 126 mile long route Gällivare ? Lule† was placed into operation. Several of the firms involved in the construction of the railroad had gone bankrupt in the meantime and so the government stepped in. On October 24, 1890, the state-owned Luossavaara Kirunavaara Aktiebolag (LKAB) was established which took the finished and the still to be constructed ore railroad under its wing. The route was extended from Gällivare to Kiruna by 1899. Due to the long transport route to Lule† and the icing up of the harbor in the winter, this was not a satisfactory solution for the long term. On September 26, 1902, the gap was closed with "fireworks and artillery shells" and there were extensive celebrations. Through impassable, almost hostile territory, the route now ran 269 kilometers / 168 miles from Gällivare to Narvik. The section from Riksgränsen on the back of the Caledonian mountain chain to Narvik on the Ofot Fjord was a special challenge: Here an elevation difference of 520 meters / 1,706 feet along steep mountainsides had to be overcome with a section of rail line 40 kilometers / 25 miles in length. The first ore train from Gällivare to Narvik ran on November 13, 1902. From November 24, 1902 on the Norwegian and Swedish State Railways finally began regular service with three ore trains per day. The official opening by the Swedish King Oscar II took place on July 14, 1903. Today this ore line combines several superlatives: It runs from Lule† in Sweden on the Gulf of Bothnia in a northwesterly direction to the iron ore mine areas of Gällivare and Kiruna above the Arctic Circle and further to the Norwegian harbor of Narvik. It is the most northerly route linked to the rest of the European rail network. In addition, the station at Narvik at 68ø26' latitude north is the most northerly rail terminal that can be reached in Western Europe for passenger service. As early as 1911 the increasing transport demands required electrification of the Swedish section of the line. Ten years later the Norwegian State Railways also followed suit and from 1922 on electric locomotives were hauling the 1,900 ton heavy ore trains continuously. World War II caused a great deal of destruction with the heavy battles around Narvik. Yet, after the end of the war reconstruction commenced immediately. In 1996, LKAB took over handling the ore traffic including transport. In addition to placing new ore cars into service, it also initially purchased from Adtranz nine twelve-axle double locomotives (IORE) that took over operations in succession starting at the end of 2000. The IORE units beat the Dm3 units in use by far with a performance of 10,800 kilowatts / 14,483 horsepower, a total weight of 360 tons, and a length of 45.8 meters / 150 feet 3 inches. Ore trains with an impressive 7,800 ton hauling capacity are pulled today with these new locomotives. Another eight IORE double locomotives have been ordered in the meantime, the last of them to be delivered starting in May of 2013. This means the final departure for the former kings of the ore line. Model: The locomotive has the new mfx+ digital decoder and extensive sound functions. It also has controlled high-efficiency propulsion with a flywheel, centrally mounted. All 4 axles powered by means of cardan shafts. Traction tires. The triple headlights and dual red marker lights change over with the direction of travel, will work in conventional operation, and can be controlled digitally. The headlights at Locomotive Ends 2 and 1 can be turned off separately. When the headlights at both ends of the locomotive are off, the double "A" lights are on. Maintenance-free warm white and red LEDs are used for the lighting. The locomotive has separately applied metal grab irons at the ends and on the sides. It also has a detailed buffer beam. Brake hoses are included and can be mounted on the locomotive. Length over the buffers 18.4 cm / 7-1/4". Prototype: TGV Lyria (train … grande vitesse) high-speed train, as a joint project of the French State Railways (SNCF) and the Swiss Federal Railways (SBB) in the version for service from Paris to Basle, Zürich, Bern, Lausanne, and Geneva. 2 powered end cars, 1 transition car (R1), 1st/2nd class, 1 transition car (R8), 2nd class. Powered rail car road number 4410. The train looks as it did in 2013. Model: The train is a 4-part set. Both end cars (TK1 and TK2) are powered. The train has an mfx digital decoder and extensive sound functions. It has controlled, high-efficiency propulsion in both powered end cars, centrally mounted. 4 axles powered through cardan shafts in each end car. Traction tires. The train has factory-installed interior lighting. The triple headlights and dual red marker lights change over with the direction of travel. They and the interior lighting will work in conventional operation and can be controlled digitally. The third headlight for the French headlight code can be turned off separately in digital operation. The headlights and interior lighting are maintenance-free, warm white LEDs and the marker lights are maintenance-free red LEDs. The train has separately applied metal grab irons. It also has inset windshield wipers. The engineer's cabs in the powered end cars have interior details. A powered end car and a transition car are permanently coupled together in pairs and have special close couplings with a guide mechanism. There is an additional guide mechanism in the Jakobs truck. The transition cars have roof hoods. The end cars have a pickup shoe changeover feature so that the pickup shoe at the front of the train is the one picking up power. The interior lighting is powered through a continuous electrical connection through the entire train. Each powered end car has 2 different design single-arm pantographs. The pantographs work mechanically but are not wired to take power. The train is a scale reproduction. The minimum radius for operation is therefore 360 mm / 14-3/16", when there is sufficient clearance on both sides. Length of the 4-part set 101 cm / 39-3/4". The 37792 basic set can be expanded with the 43422, 43432, and 43442 extension sets to a prototypical 10-car unit. SNCF and TGV are registered trademarks of the SNCF. SNCF is the owner of the TGVr. All rights reserved regarding copying and/or reproduction. Prototype: German Federal Railroad (DB) class 50 steam freight locomotive, with a coal tender as the standard type 2Ä2ÄT26 box-style tender in its original form. With Witte smoke deflectors, standard cab, long running boards in the front slanted up to the smoke box, DB Reflex glass lanterns, and inductive magnet on one side. Road number 051 013-1. The locomotive looks as it did around 1969 - 1970. Model: The locomotive has an mfx digital decoder and extensive sound functions. It also has controlled high-efficiency propulsion. 5 axles powered. Traction tires. The locomotive and tender are constructed mostly of metal. The 7226 smoke unit can be installed in the locomotive. The triple headlights change over with the direction of travel. They and the smoke unit that can be installed in the locomotive will work in conventional operation and can be controlled digitally. Maintenance-free warm white LEDs are used for the lighting. There is an adjustable close coupling with a guide mechanism between the locomotive and tender for different curves. There is a close coupler with an NEM pocket and guide mechanism on the front of the locomotive and the rear of the tender. Minimum radius for operation is 360 mm / 14-3/16". Protective sleeves for the piston rods and brake hoses are included as detail parts and can be mounted on the locomotive. Length over the buffers 26.4 cm / 10-3/8". Prototype: German Federal Railroad (DB) class 150 heavy freight locomotive. Chrome oxide green basic paint scheme. The largest class of standardized electric locomotives from the new construction program of the Fifties. With double lamps, multiple forced air vents, and continuous rain gutter. The locomotive looks as it did at the end of the Seventies / beginning of the Eighties. Model: The locomotive has an mfx digital decoder and extensive sound functions. It also has controlled high-efficiency propulsion, centrally mounted. 4 axles powered by means of cardan shafts. Traction tires. The triple headlights and dual red marker lights change over with the direction of travel, will work in conventional operation, and can be controlled digitally. The headlights at Locomotive End 2 and 1 can be turned off separately in digital operation. When the headlights are turned off at both ends, the double "A" lights are on. Maintenance-free warm white and red LEDs are used for the lighting. The locomotive has separately applied metal grab irons on the sides and ends. The engineer's cabs have interior details in relief. Brake hoses and coupler hoses are included as detail parts that can be mounted on the locomotive. Length over the buffers 22.4 cm / 8-13/16". Model: DB Schenker Rail Deutschland AG class 363 diesel switch engine. Diesel hydraulic drive with a jackshaft. The locomotive looks as it did around 2011. Telex couplers for remote uncoupling from cars. Comment: The locomotive has an mfx digital decoder and extensive sound functions. It also has controlled high-efficiency propulsion, centrally mounted. 3 axles and a jackshaft powered. Traction tires. The triple headlights will work in conventional operation and can be controlled digitally. The locomotive has Telex couplers front and rear that can be controlled separately in digital operation. It also has metal end handrails. Length over the buffers 12.0 cm / 4-3/4". Prototype: German Federal Railroad (DB) class E 93 heavy electric freight train locomotive. Bottle green basic paint scheme. Road number E 93 07. The locomotive looks as it did around 1960. Model: The locomotive has the new mfx+ digital decoder and extensive sound functions. It also controlled high-efficiency propulsion with a flywheel, centrally mounted. 2 axles of each truck powered by means of cardan shafts. Traction tires. The locomotive has triple headlights and dual red marker lights that change over with the direction of travel, will work in conventional operation, and can be controlled digitally. The headlights at Locomotive Ends 2 and 1 can be turned off separately in digital operation. When the headlights are turned off at both ends of the locomotive, the function for the "double A" light is activated. The cab lighting can also be controlled digitally. Maintenance-free warm white and red LEDs are used for the lighting. The locomotive has separately applied grab irons. The cabs and the engine room have interior details in relief. Brake hoses and coupler hooks are included that can be mounted on the locomotive. Length over the buffers 20.3 cm / 8". Operation possible in semi-pro, pro, and specialist modes. The 37870 heavy electric freight train locomotive is being produced in 2014 in a one-time series only for Insider members. Freight car sets to go with this locomotive can be found under item numbers 46199 and 47321 also offered only for Insider members. Prototype: Class 41 steam freight locomotive with a tender. Older version painted and lettered for the German Federal Railroad (DB), with Witte smoke deflectors, older design boiler, type 2Ä2ÄT34 standard design tender, DB Reflex glass lamps, inductive magnet on one side, and buffer plate warning stripes. Road number 41 178. The locomotive looks as it did around 1965.
variety of operating and sound functions that can be controlled digitally. Comment: The DB Class 41 with the Older Design Boiler The class 41 fast freight locomotive was part of the late developments in the German State Railroad's (DRG) standardized locomotive program. Different components were identical with the classes 06 and 45 developed at about the same time. A special design feature of the class 41 was also common to these other locomotives: Their wheel load could be set either at 18 or 20 metric tons in order to ensure wider use. The frame was a new development but the boiler was the same as on the class 03. The St47K had to be used as the material for the boiler due to the higher boiler pressure of 20 atmospheres or 290 pounds pressure per square inch. The Berlin Machinery Builder, Inc., formerly Louis Schwartzkopff, delivered the two sample units, road numbers 41 001 and 002, in 1936. These units were tested extensively. From 1938 on they were followed by 364 regular production locomotives that were improved somewhat and that were delivered by almost all of the German locomotive builders by 1941. Due to World War II, the DRG canceled another 70 locomotives already ordered and replaced them with the transition war designs and war design locomotives. As with other locomotives, the St47K boiler on the class 41 exhibited after a few years traces of metal fatigue since this boiler material was not resistant to aging and became susceptible to breakage at weld points. For that reason, the boiler pressure was initially reduced to 16 atmospheres or 232 pounds of pressure per square inch starting in the fall of 1941. Furthermore, the DRG purchased a total of 40 replacement boilers in 1943/44 that were made of the much more durable St34 boiler material. After World War II, there were 220 locomotives on the DB's roster and 124 on the GDR's German State Railroad (DR) roster. Since both government railroads could not do without the class 41, numerous units were equipped with new boilers. On the DB 102 units were rebuilt and equipped with welded, high-performance boiler with a combustion chamber. Moreover, 40 units were converted to oil firing. On the units not rebuilt boiler damage could be kept within limits by not exceeding the lowered boiler pressure. Improved welding techniques in the meantime took care of the problems for the most part. The class 41 units with the older design boiler were retired for the most part in the Sixties and only a few units lasted until the computer renumbering system change to the class 041 in 1968. Road numbers 041 253 and 334 were stored at the maintenance facility at Cologne-Eifeltor in September of 1970 and were retired on November 27, 1970. Prototype: Class 41 steam freight locomotive with a tender. Older version painted and lettered for the German Federal Railroad (DB), with Wagner smoke deflectors, older design boiler, type 2Ä2ÄT34 standard design tender, DRG lanterns, without an inductive magnet, and with buffer plate warning stripes. Road number 41 255. The locomotive looks as it did around 1951. Model: The locomotive has an mfx digital decoder. It also has controlled high-efficiency propulsion with a flywheel, in the boiler. 4 axles powered. Traction tires. The locomotive and tender are constructed mostly of metal. The 7226 smoke unit can be installed in the locomotive. The dual headlights change over with the direction of travel. They and the smoke unit that can be installed in the locomotive will work in conventional operation and can be controlled digitally. Maintenance-free warm white LEDs are used for the lighting. There is an adjustable close coupling with a guide mechanism between the locomotive and tender for different curves. There is a close coupler with an NEM pocket and guide mechanism on the front of the locomotive and the rear of the tender. Minimum radius for operation is 360 mm / 14-3/16". Protective sleeves for the piston rods and brake hoses are included as detail parts and can be mounted on the locomotive. Length over the buffers 27.5 cm / 10-13/16". Different road number from that for 37923. This model can be found in a DC version in the Trix H0 assortment under item number 22376. Prototype: German State Railroad Company (DRG) version of the Prussian class P10 steam passenger locomotive. Version without smoke deflectors and with a Prussian type 2Ä2ÄT 31,5 tender without additional coal bunker boards. Model: The locomotive has an mfx digital decoder and extensive sound functions. It also has controlled high-efficiency propulsion. 4 axles powered. Traction tires. The locomotive and tender are constructed mostly of metal. The 72270 smoke unit can be installed in the locomotive. The dual headlights change over with the direction of travel. They and the smoke unit that can be installed in the locomotive will work in conventional operation and can be controlled digitally. Maintenance-free warm white LEDs are used for the lighting. There is an adjustable close coupling with a guide mechanism between the locomotive and tender. There is a close coupler with an NEM pocket and guide mechanism on the rear of the tender. Protective sleeves for the piston rods are included as detail parts. Length over the buffers 26.3 cm / 10-3/8". A passenger car set to go with this locomotive is available under item number 42767. Prototype: Heavy diesel locomotive, road number 5, (class T44), privately owned locomotive painted and lettered for the Swedish-Norwegian ore railroad MTAS, for switching ore cars in the ore harbor of Narvik. The locomotive looks as it did in 2010. Model: The locomotive has an mfx digital decoder and extensive sound functions. It also has controlled high-efficiency propulsion, centrally mounted. 4 axles powered through cardan shafts. Traction tires. The 4-light headlights and a red marker light change over with the direction of travel, will work in conventional operation, and can be controlled digitally. Additional light functions can be controlled digitally. The headlights are maintenance-free, warm white LEDs. The locomotive has a representation of the engineer's cab interior. It also has separately applied metal grab irons. Length over the buffers 17.7 cm / 6-15/16". Different light functions that can be controlled digitally. New handrails on the sides and ends. Prototype: Class T44 heavy diesel locomotive, privately owned locomotive painted and lettered for Swedish line Green Cargo. The locomotive looks as it did about 2006. Prototype: German Federal Railroad (DB) class 003 steam locomotive with Witte smoke deflectors. The locomotive looks as it did around 1970. Model: The locomotive has an mfx digital decoder and extensive sound functions. It also has controlled high-efficiency propulsion. 3 axles powered. Traction tires. The 7226 smoke unit can be installed in the locomotive. The triple headlights change over with the direction of travel. They and the smoke unit that can be installed in the locomotive will work in conventional operation and can be controlled digitally. Maintenance-free warm white LEDs are used for the lighting. Protective sleeves for the piston rods and brake hoses are included as detail parts. Length over the buffers 27.5 cm / 10-13/16". Prototype: German Federal Railroad (DB) class 038 (38.10-40) steam passenger locomotive with a tub-style tender. Former Prussian P 8. Boiler with 2 domes and Witte smoke deflectors. Road number 038 193-9. The locomotive looks as it did around 1968/69. Model: The locomotive has an mfx digital decoder and extensive sound functions. It also has controlled high-efficiency propulsion. 3 axles powered. Traction tires. The 72270 smoke unit can be installed in the locomotive. Maintenance-free warm white LEDs are used for the lighting. There is a close coupling between the locomotive and tender. The engineer's cab is detailed. Brake hoses, prototype couplers, and protective sleeves for the piston rods are included as detail parts. Length over the buffers 21.0 cm / 8-1/4". Prototype: German Federal Railroad (DB) class 01 steam express locomotive with a type 2Ä2ÄT34 coal tender. Large Wagner smoke deflectors, silver boiler bands, and buffer plate warning stripes. Road number 01 138. The locomotive looks as it did around 1950. Model: The locomotive has the new mfx+ digital decoder and extensive sound functions. It also has controlled high-efficiency propulsion with a flywheel, in the boiler. 3 axles powered. Traction tires. The locomotive and tender are constructed mostly of metal. The 7226 smoke unit comes installed in the locomotive. The dual headlights change over with the direction of travel. They and the smoke unit will work in conventional operation and can be controlled digitally. Maintenance-free warm white LEDs are used for the lighting. There is an adjustable close coupling with a guide mechanism between the locomotive and tender for different curves. There is a close coupler with an NEM pocket and guide mechanism on rear of the tender. There is a mechanism in the tender to lower the coal load so that in the operations mode the coal usage can be represented visually in the tender. This function can only be used in the operations mode. Protective sleeves for the piston rods, brake hoses, and figures of the engineer and fireman are included as detail parts. Minimum radius for operation is 360 mm / 14-3/16". Length over the buffers 27.5 cm / 10-13/16". Prototype: German Federal Railroad (DB) class 42.90 Franco-Crosti freight locomotive. Version with Wagner smoke deflectors. The locomotive looks as it did around 1955. Model: The locomotive has an mfx digital decoder and extensive sound functions. It also has controlled high-efficiency propulsion. 5 axles powered. Traction tires. The locomotive has an articulated frame to enable it to negotiate sharp curves. The locomotive also has cab and running gear lights. The headlights change over with the direction of travel, will work in conventional operation, and can be controlled digitally. Maintenance-free warm white LEDs are used for the lighting. Length over the buffers 26.7 cm / 10-1/2". This locomotive can be found in a DC version under item number 22429. Model: The locomotive has an mfx digital decoder and extensive sound functions. It also has controlled high-efficiency propulsion with a flywheel, in the boiler. 3 axles powered. Traction tires. The triple headlights change over with the direction of travel. The headlights and the smoke generator that can be installed in the locomotive will work in conventional operation and can be controlled digitally. The headlights are maintenance-free, warm white LEDs. A 7226 smoke generator can be installed in the locomotive. The locomotive and tender are constructed mostly of metal. There is a close coupling with a guide mechanism between the locomotive and the tender. The front of the locomotive and the back of the tender have a close coupler with a guide mechanism and an NEM coupler pocket. Minimum radius for operation is 360 mm / 14-3/16". Brake hoses and piston rod protection sleeves are included as detail parts. Length over the buffers 24.5 cm / 9-5/8". Comment: Class E 41 - The Firecracker of the German Federal Railroad. A total of 451 class E 41 locomotives were purchased between 1956 and 1971. For several decades, they left their stamp on more than just the commuter service from the Bavarian Alps to the German coast. This successful design can be considered as a general-purpose locomotive, since it was used as motive power for practically every kind of train service during its long service life. It did not last long in the rigorous S-Bahn service, because it did not have electric brakes required for it. Its traditional task remained commuter service, in particular in push/pull operation with "Silberlinge / Silver Coins" commuter cars. Due to the required low axle load distributed over 2 two-axle trucks, the E 41 could be used with no problem on electrified branch lines. The 4 traction motors on the locomotive represented a further development of the ET 30, and the Siemens-Schuckert Plant / SSW was responsible for the drive gear. They equipped the E 41 like the other standard design locomotives with a rubber ring drive gear system. The oil-cooled transformer was equipped with a relay layout on the low voltage side, which was the source of a characteristic noise on the class E 41. This locomotive soon picked up its nicknames "Champagne Cork" or "Firecracker" on the German Federal Railroad. More than a few railroad passengers, upon hearing this sound, thought the locomotive was damaged and were more or less irritated about it. The maximum speed for this 15.62 meter / 51 foot 3 inch long locomotive was 120 km/h / 75 mph. When the German Federal Railroad raised the maximum speed for express trains at the end off the Fifties to 140 km/h / 88 mph, E 41 locomotives coming after that were only painted in green, since the elegant blue was reserved only for fast locomotives in long distance service. During its entire service life, the class E 41, from 1968 on the "141", had double-arm pantographs. Otherwise, it changed externally as the result of rebuilding and ran in Germany from the Alps to the North with three or five lights at each end, with or without rain gutters, with rounded or square cooling vents and in the color schemes that changed over time. The train safety systems were also adapted along the way and the "firecracker" was considered a proven, reliable design right up to the end of its service. Prototype: SOO Line General Motors EMD F7. Three units consisting of an A unit, a B unit, and an A unit. SOO Line caboose. Model: The locomotive has an mfx digital decoder with extensive sound functions. It also has controlled high-efficiency propulsion in the A units. 2 axles in each of the units powered. Traction tires. The headlights change over with the direction of travel, will work in conventional operation, and can be controlled digitally. The lighted side number boards and the position lights change over with the direction of travel, will work in conventional operation, and can be controlled digitally. A Mars light can be controlled separately. Maintenance-free warm white LEDs are used for the lighting. The engineer's cab has interior lighting. There is a permanent drawbar between the locomotive units. Snowplows are included as detail parts that can be mounted on the locomotive. The caboose has a frame and detailed floor constructed of metal. The brake rigging, end handrails, grab irons, and many other details are separately applied. The caboose has detailed trucks and special wheel sets. Length of the F7 over the couplers approximately 52 cm / 20-1/2". Length of the caboose over the couplers approximately 14.5 cm / 5-3/4". Engineer's cab with interior details. Comment: SOO Line F7 with a Caboose. The class F7/FP7 "Bulldogs" from General Motors EMD built between 1949 and 1953 developed into a real sales hit on American railroads. Here the saying was proven that it is simpler to count the railroads that did not buy the F7 than it is to remember which ones had the F7 in service. The F7s were everywhere! Fifty railroads bought the F7 new and more than 75 North American railroads had them in service over the years. Their classification "F" (= freight) certainly showed the original intended purpose at EMD chiefly in freight service, but due to its existing heating boiler for steam heat the F7 initially developed into the classic diesel locomotive in American passenger service in the Fifties. The F7 had 1,500 horsepower and 4,221 units were built. They were divided into three sub-classes: The F7A with a cab at one end came to 2,366 units, the cab-less F7B reached 1,483 units, and the lengthened FP7 equipped with a larger water tank for the steam heat came in at 372 units. It was thus no wonder that the rather unknown Soo Line Railroad also had several of the F7 series on its roster. More precisely, it was 26 F7A units, 6 F7B units, and 6 FP7 units. 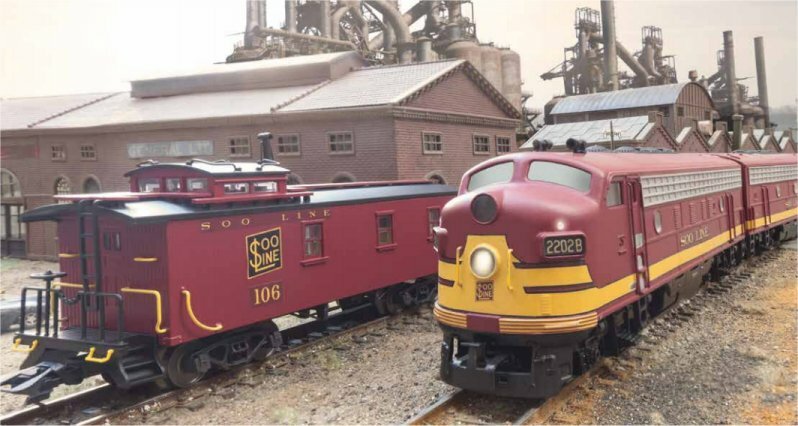 Two units have remained preserved: FP7 road number 500 as a memorial locomotive in Ladysmith, WI and FP7 road number 2500 as an operational museum locomotive at the Lake Superior Railroad Museum in Duluth, MN. The history of the Soo Line Railroad is interesting: Prominent business people from Minneapolis founded the Minneapolis, Sault Ste. Marie and Atlantic Railroad in 1883. It quickly became the Soo Line due to the pronunciation of "Sault". The Soo Line was planned as a railroad to transport the grain products from Minnesota's farmers and mills und quickly to eastern markets. The line was renamed Minneapolis, St. Paul and Sault Ste. Marie Railroad as early as 1888 and the route network was gradually expanded throughout the upper Midwest to Canada. In 1909, the Soo Line took over the Wisconsin Central Railway in the form of a least agreement. Finally, in 1961 the Minneapolis, St. Paul and Sault Ste. Marie Railroad merged officially with the Wisconsin Central Railway and the Duluth, South Shore and Atlantic Railroad under the new name Soo Line Railroad. In 1985, the Soo Line acquired the remainder to the bankrupt Milwaukee Road. In the Nineties, the Canadian Pacific Railway as a shareholder of many years took over the railroad completely and ended its existence as an independent business. Prototype: Danish State Railways (DSB) class MY 1100 diesel locomotive. NOHAB general-purpose locomotive in the wine red paint scheme of Era III. Model: The locomotive has an mfx digital decoder and extensive sound functions. It also has controlled high-efficiency propulsion, centrally mounted. 4 axles powered by means of cardan shafts. Traction tires. The triple headlights and dual red marker lights change over with the direction of travel, will work in conventional operation, and can be controlled digitally. The headlights at Locomotive End 2 and 1 can be turned off separately in digital operation. The cab lighting can be turned off separately in digital operation at Locomotive End 1 and 2. Maintenance-free, warm white and red LEDs are used for the lighting. The locomotive has separately applied metal grab irons. The engineer's cabs and the engine room have interior details in relief. Length over the buffers 21.7 cm / 8-1/2". 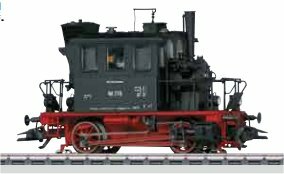 A car set to go with this locomotive can be found under item number 42768 in the Märklin H0 assortment. A car set to go with this locomotive can be found under item number 43544 in the Märklin H0 assortment. Prototype: Danish State Railways (DSB) class MY 1100 diesel locomotive. NOHAB general-purpose locomotive in the black and red paint scheme of Era IV. Prototype: German Railroad, Inc. (DB AG) class 648.2 (LINT 41) diesel powered commuter car. Version with low entries. The train looks as it did in 2011. Model: The train has four built-in displays that represent the doors in digital operation and that can play back typical scenes for boarding and leaving the train. The train has an mfx digital decoder and extensive sound functions. It also has controlled high-efficiency propulsion located in the Jakobs truck. 2 axles powered. Traction tires. The train has factory-installed interior lighting. Maintenance-free warm white LEDs are used for the headlights and interior lighting. Yellow LEDs are used as in the prototype for the train destination signs. The headlights, train destination signs, interior lights, and dual red marker lights will work in conventional operation and can be controlled digitally. The frame and body have detailed construction, an open view, interior details with 29 standing and seated figures, a closed diaphragm, and a guide mechanism on the Jakobs truck between the train halves. The ends of the train have a representation of the center buffer couplers. Total length 48.1 cm / 18-15/16". Interior details with 29 seated and standing figures. Prototype: Austrian Federal Railways (ÖBB) class 1116 general-purpose locomotive. The locomotive looks as it did around 2006. Model: The locomotive has an mfx digital decoder and extensive sound functions. It also has controlled high-efficiency propulsion. 4 axles powered. Traction tires. The triple headlights and dual red marker lights change over with the direction of travel, will work in conventional operation, and can be controlled digitally. Maintenance-free warm white LEDs are used for the headlights. The engineer's cabs have interior details. The locomotive has separately applied metal grab irons. Length over the buffers 22.5 cm / 8-7/8". Passenger cars to go with this locomotive can be found in the 42728 set. Model: The rail bus has an mfx decoder and extensive sound functions. It also has controlled high-efficiency propulsion with a flywheel in the motor car. 2 axles powered. Traction tires. The rail bus has factory-installed interior lighting in the motor car and the trailer car. The rail bus has dual headlights and dual red marker lights that change over with the direction of travel, will work in conventional operation, and can be controlled digitally. The headlights at the Engineer's Stand 2 and 1 of the motor car can be turned off separately. Dual red marker lights are on for the trailer car depending on the position of the motor car. Maintenance-free warm white and red LEDs are used for the headlights, marker lights, and interior lighting, and they can be controlled together in digital operation. The rail bus units have a current-conducting drawbar coupling with a guide mechanism between them. An additional non-current-conducting drawbar coupling is included for use in multiple hookups of rail bus sets. When you have a maximum 4-part unit (2 double units), the red marker lights on the trailer car can be turned off by means of a switch. The engineer's stands and the cars' interiors in the motor car and trailer car allow an open view through the windows. Brake hoses are included and can be mounted on the rail buses. Length of the two-unit set 28.2 cm / 11-1/8". Extensive operating and sound functions included. Headlights on the motor car can be turned off separately in digital operation. Comment: VT 95.9 with the VB 142 (Rail Bus and Trailer Car) The first rail buses arose from the desire as early as the Thirties to develop lightweight, modest vehicles that made use of parts and assemblies from trucks and street buses. Soon after the end of World War II, the German Federal Railroad recognized that operations on many uneconomical branch lines could be maintained against the growing competition on the roads only through the extensive use of such rail buses. In 1949, the car builder Uerdingen was therefore awarded the contract to develop such a vehicle. Eleven prototypes were placed into operation between March and August of 1950. The similarity to street buses was unmistakable. A wheelbase of 4,500 mm / 14 feet 9 inches, lightweight shock absorbers, as well as a truck trailer coupling were characteristic features. A Büssing motor with 110 horsepower output connected to a mechanical six-speed transmission mounted below the floor provided the drive system to one wheel set. Road number VT 95 912 (later VT 95 9112) came in November of 1950 and was the last, above all groundbreaking pre-production unit. Special permission from the transport minister allowed the wheelbase on this rail bus to be lengthened to 6,000 mm / 19 feet 8 inches. Sufficient seating room was now available thanks to the lengthening of the car body. After exhaustive testing an entire family of rail buses came into being in the Fifties. A first series of 60 units of the single-motor VT 95 rolled out from the builders starting in 1952. The fixed wheelbase of 6,000 mm / 19 feet 8 inches remained but otherwise there several changes. The ends were now ellipsoidal in shape and were equipped with curved skylight windows. The skylight windows were done away with on later series. Three-part folding doors on the car ends allowed passengers to get on and off quickly. The short wheelbase of 4,500 mm / 14 feet 9 inches was kept on the accompanying trailer car, the class VB 140 (not designated as the class VB 142 until the end of 1953), but their shape was adapted to that of the motor cars. Lightweight Scharfenberg couplers now transferred the tractive and impact forces. Sprung shock absorber bales served elastically to absorb gentle contact with normal buffers. By 1955 five additional series with a total of 496 rail buses followed the first one, whereby the performance was continuously increased with the installation of 130 and later 150 horsepower motors. The DB finally replaced steam locomotives on numerous branch lines with these units, because operations on many lines could only be maintained at all with the extremely economical operation of the rail buses. The single-motor rail buses (from 1968 on the class 795) were retired in large numbers starting in the mid-Seventies. The last one, road number 795 445, was pulled from service in 1983. Numerous 795 rail buses found a new lease on life in other countries and in Germany on museum railroads of course. Road number 795 240 (former VT 95 9240) belongs to the DB's museum roster. This model can be found in a DC version in the Trix H0 assortment under item number 22995.